You would have to fly around the world four hundred million times to add one second to your life; but your life would be reduced by more than that by all those airline meals. I think the universe is completely self-contained. It doesn't have any beginning or end, it doesn't have any creation or destruction. Each time new experiments are observed to agree with the predictions the theory survives, and our confidence in it is increased; but if ever a new observation is found to disagree, we have to abandon or modify the theory. All that my work has shown is that you don't have to say that the way the universe began was the personal whim of God. I do not agree with the view that the universe is a mystery, something that one can have intuition about but never fully analyze or comprehend. Each equation, I was told, would halve the sales of the book. But that was okay. Equations are necessary if you are doing accountancy, but they are the boring part of mathematics. Most of the interesting ideas can be conveyed by words or pictures. I regard [the many worlds interpretation] as self-evidently correct. [T. F.: Yet some don't find it evident to themselves.] Yeah, well, there are some people who spend an awful lot of time talking about the interpretation of quantum mechanics. My attitude — I would paraphrase Goering—is that when I hear of Schrödinger's cat, I reach for my gun. In an infinite number universe, every point can be regarded as the center, because every point has an infinity of stars on each side of it. The laws of science, as we know them at present, contain many fundamental numbers, like the size of the electric charge of the electron and the ratio of the masses of the proton and the electron.... The remarkable fact is that the values of these numbers seem to have been finely adjusted to make possible the development of life. The point is that the new raw material doesn't really have to come from anywhere.... The universe can start off with zero energy and still create matter. A million million million million (1 with twenty-four zeros after it) miles, the size of the observable universe. 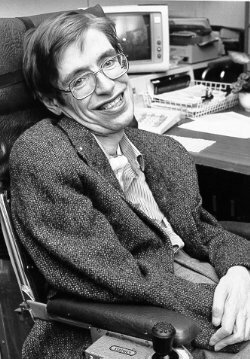 Bio: Stephen William Hawking was an English theoretical physicist, cosmologist, author and Director of Research at the Centre for Theoretical Cosmology within the University of Cambridge.